You have probably noticed that the price of gasoline has fallen a little lately. In January, the national average retail price of gasoline in the US fell to $2.20, as low as it’s been in 15 years. I filled my car at Costco a few weeks ago for just $1.92 a gallon. But how much does it really cost to fuel your car? Or, as an economist would put it, what is the opportunity cost of buying motor fuel? I would argue that the proper measure of opportunity cost in this case is the number of hours your have to work to buy the gasoline you need to drive your car 100 miles. That turns out to be lower now than it has ever been in the history of the automobile. 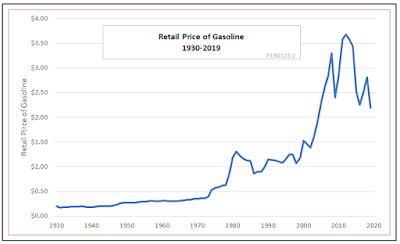 Let’s take a little tour through the ages to see just how cheap gasoline is today. I’m old enough to remember when I could fuel up my first car, a ’46 Plymouth, for 25 cents a gallon. The trouble is, that ’46 Plymouth, with its underpowered straight-six engine and 3200 pound curb weight, only got 15 miles per gallon, and my summer job driving a farm truck only paid $1 an hour. Do the math, and you’ll see that means I had to work exactly 100 minutes — the better part of two hours — to buy enough gas to drive 100 miles. Let’s go back even farther. A hundred years ago, your great-grandpa probably drove a Model T Ford. If he was an average factory worker, he would have earned 47 cents an hour. His Model T would have gotten something like17 miles a gallon and a gallon of gas would have cost 25 cents —about the same as a pound of steak at the butcher’s. 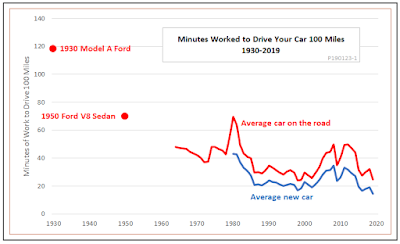 Do the numbers, and you will see that your great-grandpa had to work 187 minutes — more than 3 hours — to drive 100 miles. By 1930, cars were faster and safer. You didn’t have to hand crank them to start the engine, so a lot more women were driving. Your grandma may have driven a Model A. If she was lucky enough to have a good factory job, she would have earned about 75 cents an hour. Gas was cheaper by then, about 20 cents a gallon, but the Model A only got 14 miles a gallon. That comes to just under 2 hours of work to drive 100 miles. By 1950, wages had risen a lot. The average worker — not a kid with a summer job — was earning about $1.50 an hour. The average price of gasoline was 30 cents, so an hour’s work would buy you five gallons — a big improvement from the prewar days. But cars, bigger, heavier, and faster now, still only got about 15 miles per gallon You still had to work well over an hour to drive 100 miles. Now fast forward to today. An efficient new car like a Ford Focus — not even a hybrid — gets 40 miles per gallon. The average wage of production and nonsupervisory employees is $23 an hour. Gasoline, as of January 2019, is averaging $2.20 a gallon. All that means it takes you less than 15 minutes to earn enough to buy the gas you need to drive 100 miles. What this cones down to, if you like cheap driving, the good old days are now. But hey, I’m an economist — the dismal science, remember? There must be a fly in the ointment, and there is. Back in the days of the Model T, people weren’t worried about climate change. Things are different now. Driving long distances in big, gas-guzzling cars isn’t fun any more — it’s a threat to the planet. Today, anyone who cares about climate change should be rooting for higher prices, not lower. It’s time to bend that curve, and bend it back upward. How about a nice carbon tax of $50 a ton or so? That would drive the retail price of gasoline up by about 50 cents a gallon. But even then, it would take just 20 minutes to buy enough gas to drive a modern, economic car 100 miles. What are we afraid of?